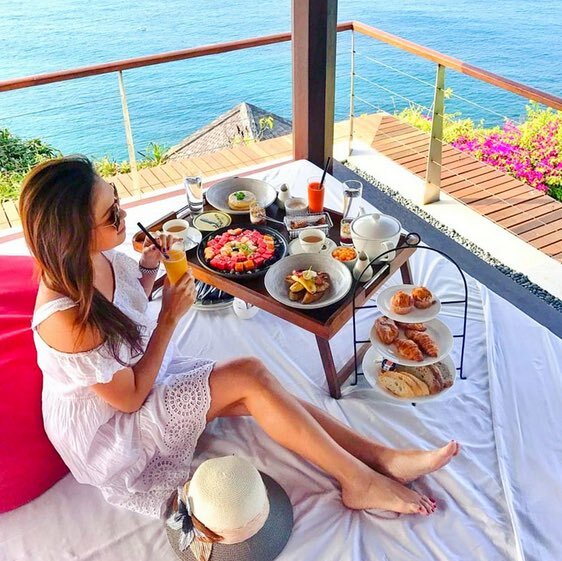 Of course we all love an amazing escape to the island of beautiful Bali and we didn’t think it could get any better until now! Through our vast network across the island, we are able to bring you a few new ideas on things to do, to make your next Bali escape, wedding or honeymoon even more memorable. How does the idea of tasty pastries, fresh scones with jam and cream sound….. 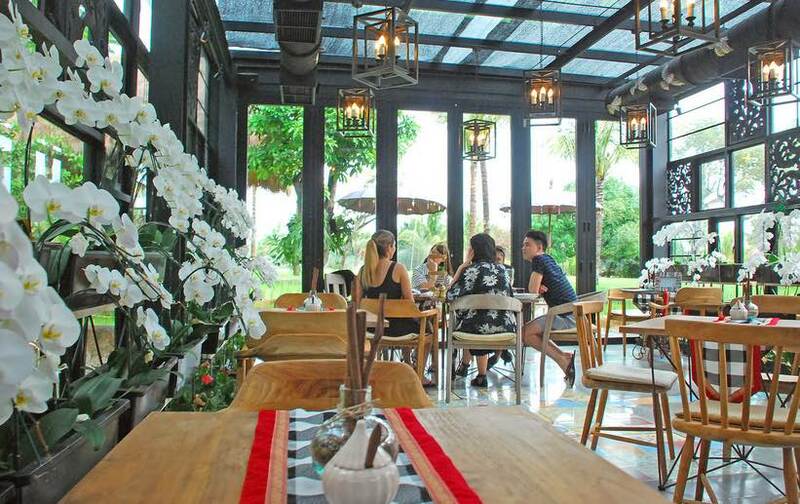 Coupled with some of the best coffees and teas from around the Archipelago sound? 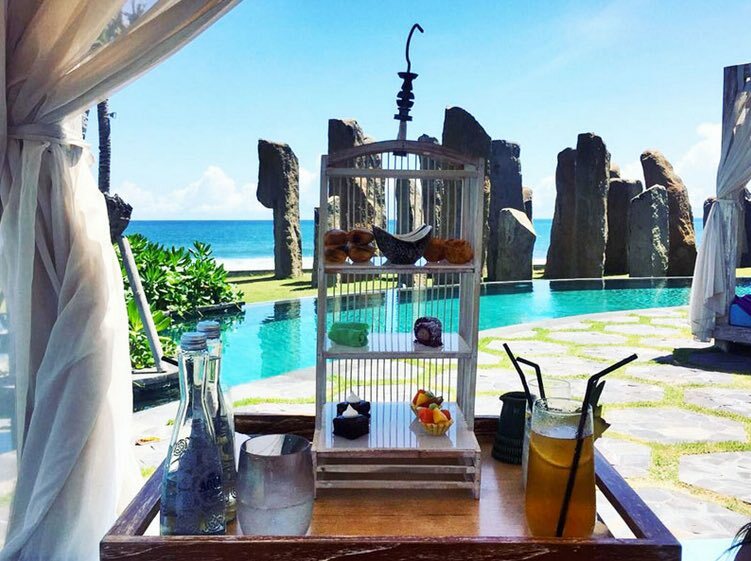 That’s right; the high tea experience, has hit the island of Bali! After exploring some of the many popular tourist attractions; spent some time at the beach and got some shopping out of the way, it’s time for some afternoon ‘me time’ with the girls. Be treated like royalty and maybe combine a few cocktails, glass of sparkling to wash down the sweetest of delights. What a great way to spend an afternoon with your girlfriends sipping tea and catching up on all the gossip from the wedding party. Make it a couple’s romantic excursion, a chit chat with friends and family, or just a girl’s time out session away from the kids. See some of our carefully chosen high tea venues below….. The Royal Purnama’s Standing Stones Restaurant is just that; a real stand out with its unique natural stone statues, a beautiful contrast to offset the azure ocean backdrop. You may almost think your among one of the ancient wonders of the world; Stonehenge! So now it’s time to try to hold your cup with just your index finger and thumb; choose an alfresco patio seat, maybe a spot on the lawn, or sit in air-conditioned comfort. The menu boasts a variety of French loose leaf teas; maybe a relaxing chamomile, or one of the specially blended Earl Grey specialties. But of course you will have to try an accompanying fresh pastry, homemade cake or biscuits. Guests can pay an additional $35Aud for a private poolside gazebo and burn a few calories after consuming some of the delectable sweets. As the saying goes; ‘When in Rome do as the Romans do’! Folk Pool & Gardens gives the chance to try some authentic Indonesian delicacies and sweets, where the deserts are the star of the show! Located in the mystical rain forests of Ubud, this is the place to find true peace and serenity, with a cup of tea or coffee of course. Guests can enjoy free pool access which is just a hop, step and a jump from your private cabana. Your waitress will deliver a traditional three tiered sweets platter, complimented with traditional banana leaf layering and a pleasant mixture of Indonesian delights. All ingredients are locally grown and supplied by local farmers and masterful desert chefs. After pleasing your pallet lay back and slip into a state of pure relaxation in your cabana or just sway gently in a hammock amid the lush tropical rainforest surrounds. There’s no rush here and an artisan come gypsy theme will inspire your inner soul. If your staying in Seminyak, Uluwatu or Canggu you’ll have to make a day trip of this as Ubud is about a 2 hour drive, But, worth it as you get to experience another part of Bali. Be ready to be blown away, by breathtaking views of the endless Indian Ocean, from the overhanging Cliff Bar, at The Edge Resort. A glass floor which is built out beyond the cliffs edge; hence the name “The Edge” will certainly add another dimension and test your sense of heights at the same time! Situated atop the soaring cliff-tops of Uluwatu, on Bali’s southernmost tip, is the popular Bukit Peninsula. The Edge offers a unique afternoon tea experience, in every sense of the word. A huge free-form pool, to be utilized at your leisure, and an outdoor bar that serves cocktails, that are equally amazing, as the venue itself. Treat yourself to the mouth watering deserts prepared by the masterful in-house chef. Cream buns smothered in mango mousse, open finger sandwiches, delectable truffles and roulades for something a little savory, just a few of the wonderful treats to choose from. Location: Jalan Pura Goa Lempeh Banjar Dinas, Pecatu, Bali. 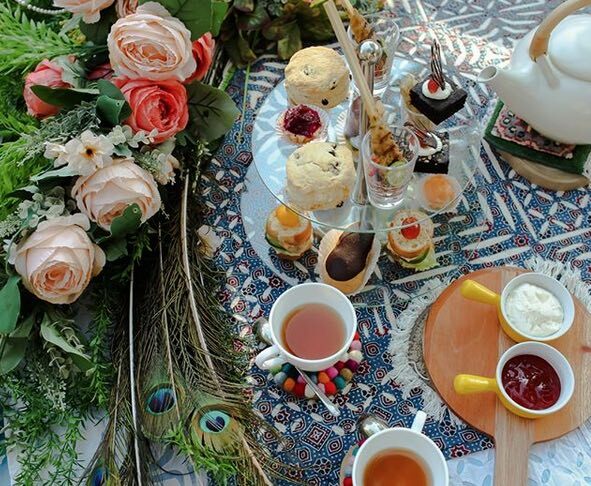 Be treated like royalty with a traditional old world high tea experience, at “The St. Regis Resort”, Bali. Be ready for exceptional service by the highly skilled, professionally trained and ultra-friendly staff at the St. Regis Resort. Here you get the full treatment with private butler service, white gloves and all. Be pleasantly transported to a place by the fine tunes of classical piano music in the background. Step back in time and stretch out on a traditional Royal day bed, on the terrace or the European inspired King Cole Bar. 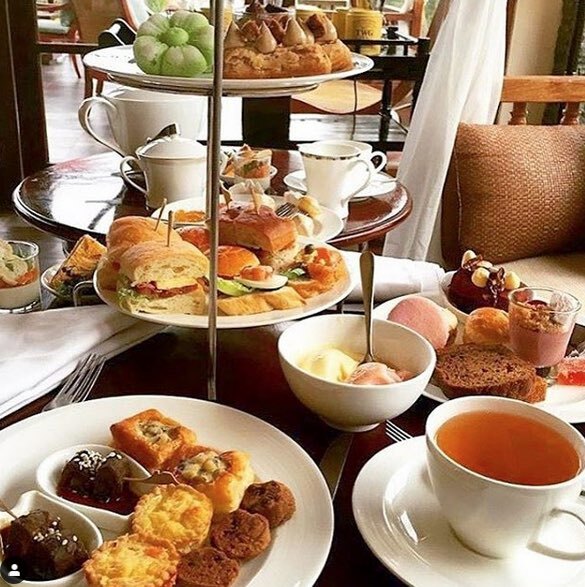 Experience a high tea that has roots of a British styled experience; pastry chefs will serve you with an amazing selection of cakes and scones. And best of all this is a buffet, so don’t come with a full tummy because you can eat as much as you like! Location: Kawasan Pariwisata, Nusa Dua, Bali. Orchid is certainly the operative word at this beautiful tea house, with its entire glass structure, boasting a gorgeous array of colorful orchids. Extravagant selections, of carefully chosen species of orchids are on display, with origins from Holland and Amsterdam. The tea house also boasts beautiful rice terraced views and an abundant array of native outdoor and indoor flowers to compliment the magnificent orchids. The cake display will your mouth watering and senses heightened as you enjoy a delectable selection of cakes and some traditional Indonesian specialties with ingredients such as coconut milk, cassava flour, grated coconut sugars and palm sugar syrups……yummy!! And there is a selection of open finger sandwiches offering something a little savory for the pallet. Try a Thai iced tea or maybe a more traditional Dilmah tea to compliment everything that is beautifully rich and tasteful. But for those whom may prefer an afternoon coffee, there are plenty to choose from as well. The tea house sits beside a manicured lawn, providing a level of intimacy and making it an ideal location for a special event; birthdays, weddings and the like. This would certainly have to be one of the most attractive afternoon tea venues on the island!